National guidelines suggest excision of ductal carcinoma in situ (DCIS) followed by radiotherapy and endocrine therapy in selected patients, based on clinical trial evidence for invasive breast cancer and DCIS. 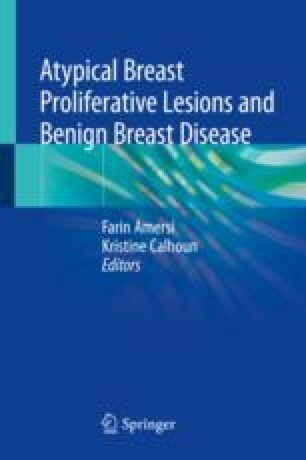 The heterogeneous nature of DCIS is reflected in the natural history of some, but not all, progressing to invasive disease. Multiple trials of active surveillance versus surgical management are currently underway and will determine whether patients with low-risk DCIS, like those with selected prostate or thyroid cancer, may be managed without the potential morbidities and costs associated with surgical intervention. Alternative strategies harnessing immune responses, including vaccination, are underway. Quality of life and patient reported outcomes will also guide whether nonsurgical interventions may, in future, become standard of care for selected women with DCIS. National Comprehensive Cancer Network. Incorporated. https://www.nccn.org/patients/guidelines/stage_0_breast/. Accessed 10 Feb 2018. Neoadjuvant Herceptin for Ductal Carcinoma In Situ of the Breast. ClinicalTrials.gov Identifier:NCT00496808. Neoadjuvant Trial of Lapatinib for the Treatment of Women With DCIS Breast Cancer. ClinicalTrials.gov Identifier:NCT00555152. COMET. http://www.pcori.org/research-results/2016/comparison-operative-versus-medical-endocrine-therapy-low-risk-dcis-comet. Accessed 10 Feb 2018. LORIS A phase III trial of surgery versus active monitoring for low risk ductal carcinoma in situ (DCIS). http://www.birmingham.ac.uk/research/activity/mds/trials/crctu/trials/loris/index.aspx Accessed 10 Feb 2018. EORTC LORD. http://www.eortc.org/research-groups/breast-cancer-group/ongoing-and-future-projects/ Accessed 24 Feb 2017. A HER-2/neu pulsed DC1 vaccine for patients With DCIS. ClinicalTrials.gov Identifier:NCT00107211. A randomized trial of HER-2/neu pulsed DC1 vaccine for patients with DCIS. ClinicalTrials.gov Identifier:NCT02061332.